Nicholas Rougeux is an artist who creates fascinating visualizations from urban weather pattern data, Shakespeare sonnets, and more. 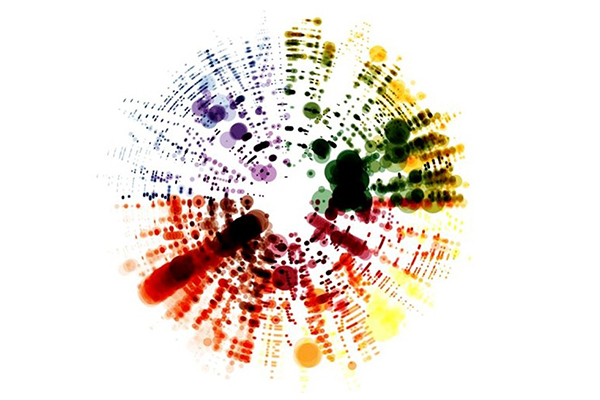 Recently, he explored famous classical music scores and transformed well-known works into splashes of vibrant color that represent the notes on a five-bar staff. Nicholas arranged the actual notes of the score into a circle and then replaced them with various sized dots – longer notes got bigger dots, and shorter notes got smaller ones. Different colors indicate different instruments. The distance of any colored dot from the center reflects the note’s pitch: dots farther away from the center are higher notes, and those closer to the center are lower notes. Head to his website and see if you can the recognize the music in his representations of pieces from Antonio Vivaldi, Gioacchino Rossini, Johann Pachelbel and George Frideric Handel and more.